One typical heuristic how to place an observer in a room is attaching it to a corner of the ceiling. Heuristics have been used without objective evaluation of the quality of the position. However, the quality of vision can be improved by choosing a decent position of the viewpoint and a good orientation of the observer. As an example, take the two-dimensional illustration of a scene to the right. 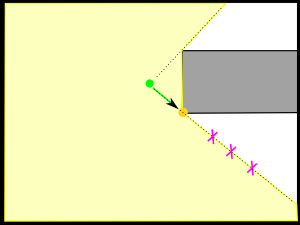 The field of view (FOV, yellow) of the viewpoint (green dot) is occluded by obstacles (grey). 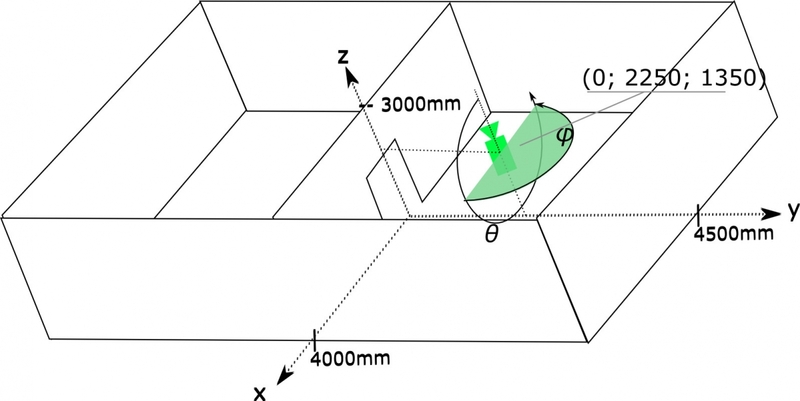 When repositioning the viewpoint (along green arrow), we discover that the FOV as well as the volume of the FOV are functions depending on the observer’s position in the scene. Moreover, the volume of the FOV is a real value function (domain is the whole scene) which is discontinuous at the orange point: The lower half of the room suddenly becomes visible there. The example suggests that the geometry of a room has a huge influence on the visibility and may be used to create evidence of good positions. This is also true for observers in three-dimensional space with a limited opening angle, a camera say. So, given the parameters of the observer, one of my aims is to derive properties of the quality function, such as continuity, and decent observer parameters right from the geometry of the room. This knowledge can be transfered to more complex vision systems that reconstruct objects, track or trace them. This is a collaboration with Prof. C. Knauer.